This Saturday night at Atlantic City, New Jersey’s resurgent Boardwalk Hall an extraordinary ladies’ night will culminate in the coronation of an undisputed Middleweight champion after undefeated title holders Claressa Shields and Christina Hammer settle their well-publicized personal differences during their 10-round bout. Based on a litany of implications, the fight is arguably the most important bout in the history of women’s boxing. A pool of talent desperately awaits confirmation that they can truly be all in regarding their professional aspirations of earning a living as a fighter. CLICK HERE TO CHECK OUT THE BITE DOWN BOXING PODCAST’S REACTION VIDEO TO THE FINAL EPISODE OF SHOWTIME SPORTS’ ALL ACCESS: SHIELDS VS HAMMER. After just eight fights Shields, 24, plans to destroy – T Rex’s own words – Germany’s 28-year old WBO champion Hammer (24-0, 11 KOs), ending her nearly nine-year reign as a world champion. Shields actually plans to snap before adding Lady Hammer’s red belt to her collection of green, light blue, and black belts. 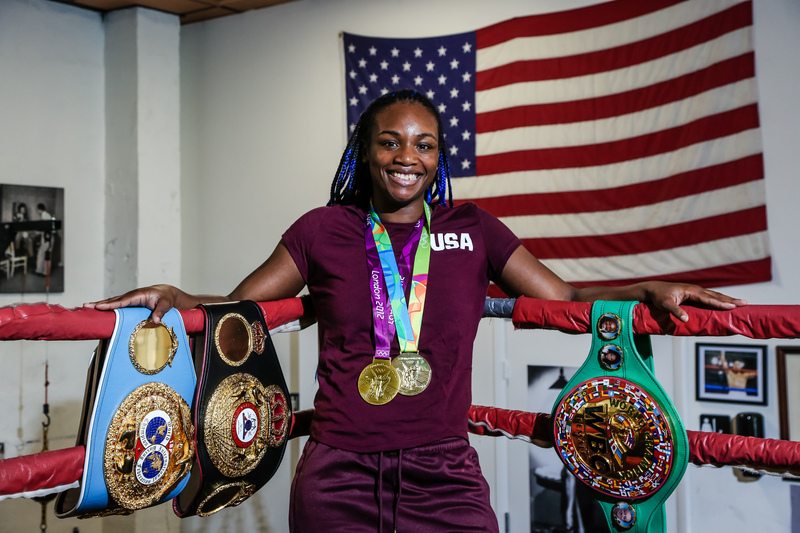 Hammer still has some unexplained claim to her green WBC belt which we thought Shields picked up, while it was vacant, when she fought Hannah Rankin last November – a date Hammer missed with an undisclosed illness. The two combatants also have a chance to add Ring Magazine’s classic red-white-blue striped belt Saturday night. This writer has already made the hard sell for Shields to adopt Queen Latifah’s royally fierce “Latifah’s Had It Up 2 Here” to her ring walk – primarily as a response to her harshest critics. No sense in reliving that suggestion here when you can check it out here in its entirety. “Queen” isn’t necessarily “G.W.O.A.T.” but admittedly the major problem here could be, with the fight being held in Atlantic City, we’re just asking too much of that crowd to participate the way a venue full of Michigan fans may have done were Shields fighting in the Mitten State. However, New Jersey is home to Latifah. I’m just saying. Not too dissimilar to Latifah trying to show maturation and the ability to expand upon her lyrical content and sound from her gold-selling debut album All Hail The Queen, with this bid to join Welterweight Cecilia Brækus as the only undisputed champions in women’s boxing, Shields finds her self still, strangely, convincing some fans of the significance of her two Olympic gold medals. Many detractors deride her feat of becoming a two-division unified champion in just six fights. The build up to this showdown with Hammer took a circuitous route. And, as most major boxing rivalries go, the majority of the activity since the second announcement of Shields vs. Hammer escalated into trash talk. The trash talk online and during the recent press conferences paled in comparison to the heated exchanges in the ring following Shields’ last several fights. With the single and video “Paper Thin“, released in the fall of 1998, pioneering female MC Lyte – now a busy film and TV actress – spurned the unwanted advances and empty promises of some cat named Sam. The relationship between Shields and Hammer hovers around love-hate, but the pair have been “seeing” each other since as early as Shields’ one-sided TKO5 victory over Nikki Adler in August 2017. Moreover, the two are definitely partners working together to successfully trigger an explosion of rapid growth in new interest for women’s boxing that hopefully ensues April 14. Easy for an outsider to say that Shields should waste little to no time defending her accomplishments, or her skills as a boxer, to a platoon of critics who get paid to talk about her doing her thing. For some of them who only throw shots tapping keys on their keyboards, their personal track record of covering boxing is indicative of how spot-on AT&T’s recent ad campaign is for more than just cell service networks: Just OK Is Not OK. Whether Shields makes her way to the ring shouting Latifah’s bold “I Got It” or not, the night would really be dope if after she exits the ring as an undisputed champion she would politely hand out some Nike tongues to a few individuals of the mainstream media who have personalized matters. Because, 30-plus years later after Latifah’s sneakers metaphor, talk is still cheap. Give it to ’em Queen!